A tenured, associate professor at Midwestern State University, Bradley advises a weekly newspaper with an award-winning online and social media presence. Having received his doctoral degree in public administration with research work in media agenda-setting and local governments, as an associate professor, he teaches news reporting and advanced reporting. Bradley is the editor of the national magazine, Communication: Journalism Education Today, for the national Journalism Education Association and co-managing editor of College Media Review for the College Media Association. He has received the Gold Key from the Columbia Scholastic Press Association, the Pioneer Award from the National Scholastic Press Association, the Star of Texas from the Association of Texas Photography Instructors, the Trailblazer Award from the Texas Association of Journalism Educators and the Carl Towley Award from the Journalism Education Association. In 2014, the National Press Photographers Association named him the Robin F. Garland Educator of the Year and the College Media Association named him a Distinguished Adviser Award for newspaper advising at a four-year college or university. Editing publications since 1982. Now editor of a national magazine (for the last 21 years) and contributor to dozens of other media outlets online and in print. My first job was as a high school teacher. Now I'm a college professor with a doctorate. But education has been a part of all of my jobs. Since I got started in photojournalism in 1979, as a photographer for the Westlake Picayune (Austin, Texas), photojournalism has played a critical role in all of my job. 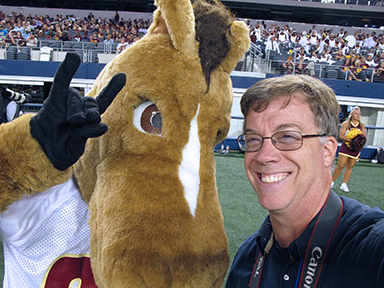 Midwestern State University Associate Professor, Director of Student Media • September 2012 – present Taught courses that included components of grammar, spelling, punctuation and AP style. In-depth units in media law, ethics, photojournalism and social media. Advised student media including weekly student newspaper, The Wichitan, and weekly news broadcast, Campus Watch, both with online components including social media such as Twitter and Facebook. North Carolina State University Coordinator, Student Media Advising • Dec. 2002-Oct. 2011 While pursuing PhD, taught training classes in photojournalism, design, reporting, diversity, media law and copyediting. Prepared online training materials at ncsu.edu/sma, making use of online classroom systems such as Blackboard. Supervised professional staff of five including human resource and information technology operations. Advised daily newspaper, yearbook, literary magazine, television operation, radio station and online media. Wrote press releases and numerous documents to promote and document activities of program within the university system and externally. Prepared budget exceeding $800,000 and manage day-to-day, non-content-related issues. For about 10 years, served as administrative liaison between students and campus administration. Publications received numerous state and national awards including the Gold Crown from CSPA and the Pacemaker from ACP. Kansas State University Visiting Assistant Professor • Aug. 2001-Dec. 2002 Taught classes to PR, advertising and print media students on Web communication, photojournalism, editing and design including classes that required specific knowledge of current trends in print media, multimedia, technical skills in AP style, photojournalism and Web-page development. Coordinated awards program including writing press releases. National Press Photographers Association Executive Director • Jan. 1999- Feb. 2001 Coordinated the day-to-day operations of this 10,000-member professional association for television and still photojournalists including managing workshops, $1.8 million budget, membership activities, staffing, press relations, contract negotiation, sales items and media relations. On a daily basis, worked with publishers, editors, photographers and reporters at television stations, magazines and newspapers all over the world. Assisted board members with writing and implementing policy, including writing first policy handbook. Negotiated hotel contracts for national and regional conferences. Supervised national office staff. Prepared budget and regular budget reports. Maintained membership database and regular membership reports. University Interscholastic League Assistant Academic Director • Aug. 1997 – Jan. 1999 Produced bi-monthly newsmagazine working with numerous writers and photographers as managing editor of the Leaguer (circ: 35,000). Edited numerous other UIL publications related to all facets of UIL’s mission. Provided information to legislators, local and state media regarding academic competitions. Coordinated state-wide conferences and numerous contests at all grade levels including arranging for speakers locally, regionally and nationally. Coordinated academic contests for high school, junior high and elementary. Managed academic professional and student staff members. Taylor Publishing Company Marketing Department Manager • Aug. 1993-June 1996 Managed technology branch including indirect supervision of engineering, production and education staffs for one of the nation’s largest book publishers headquartered in Dallas. Represented company to public and media. Led Total Quality Management teams and re-engineering process team that resulted in new $2.5 million production environment. Served as art director on numerous photographic/art projects. Pioneered technical support/customer service division for desktop publishing environment. Helped to setup and maintain computer network and Internet presence. Irving High School Publications Adviser • Sept. 1992-Aug. 1993 Advised student publications ($50,000 budget) and taught classes in photography, journalism and publications production for suburban school district near Dallas. Wrote curriculum guide. Coordinated and taught at numerous workshops throughout the Metroplex, state and nation. Wimberley Independent School District Public Information Officer Sept. • 1989-Aug. 1992 Handled media relations with Austin/San Marcos/San Antonio newspapers, radio and television stations. Edited central administration publications for rural school district including district’s annual report. Advised student publications ($12,000 budget) and taught classes in all aspects of media. Wrote district technology plan. Westlake Picayune Head photographer • 1981-Jan. 1987 Coordinated all darkroom and photography for a large, weekly newspaper. Served as special section editor for three consecutive years. Assigned stories, photos and assisted with typesetting. Supervised photography staff and free-lance photographers. Worked with other Austin-area media as free-lance photographer and writer.